Regardless if you are a seasoned casino player or just a novice learning casino and roulette vocabulary used in casinos around the world this will help you with your game as well as with your interactions with other players and casino staff. We have taken the time to collect the most popular gambling words and phrases plus casino lingo used by roulette players during the game. Without further ado, here is our roulette terms glossary. Action – The total amount of wagered dollars over a given period of time. Usually kept track for bonus comps and loyalty programs. Action Player – Is used to describe players who consistently bet big. American Roulette – Please see American Roulette article for more in depth definition. The main difference to be noted is that the wheel has an added number on the wheel, 00, which provides the house with a higher edge. Backtrack – Known as the ball-track. It’s the rim outside of the wheel where the ball is spun. Bankroll – The total amount of money a gambler has set aside to play with. Biased Numbers – Numbers on the wheel that statistically hit more often than standard variance proven over a long-term analysis. Biased Wheel – An imperfect wheel that causes certain numbers or sections to be hit at a higher rate than normal. Big Number – Number or numbers that hit more than its theoretical average. Aka Biased Numbers. Black Action – when players are betting with black $100 chips. Black Bet – A wager that the next number will be black. Black Chips – chips with $100 value. 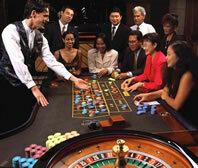 Bottom Track – Is the slanted, stationary, inner area of the the roulette wheel. The roulette ball slides down the bottom track before bouncing into the wheel head and pocket. Cage – Area of the casino where players cash out there chips. Cancellation Betting System – Similar to the LaBouchere System. A betting system that uses a series of numbers that cancels numbers after winning a wager and adds numbers after losing a wager. Capping a Bet – a form of cheating where players discretely add more chips to a winning number. Casino Advantage – the edge, vig or ev the casino has over the player. Casino Host – casino employee who takes care of customer requests. Normally, caters to high rollers. Chameleon Strategy – mimicking hot or winning players on the roulette table. Chasing Losses – increasing bet sizes in order to win back what has already been lost. Check Rack – the tray that holds and organizes casino chips. Checks – an alternative name for casino chips. Choppy Game – a term used to describe a game where neither the house or player is winning. Colour Up – process of exchanging lower denomination chips to larger denomination chips. Cold Table – any table where the house is winning and the players at the table are on a losing or cold streak. Column Bet – a wager that is placed on the columns of 12 numbers. Combination Bet – any bet that has one or more chips on two or more numbers. Comp – freebies or bonuses given out by the casino. Corner Bet – a single bet that one of the four numbers on the layout will win. d’Alembert Betting System – where players increase bet size by one unit after a loss and decrease your bet unit by one after a win. Dead Table – table that is ready to be played, but no players. Double Up System of Betting – system of betting where the player increases the bet by two after a loss to recoup the loss of the previous bet. Double Zero Wheel – A wheel with a 0 and a 00. Most commonly referred to as an American Roulette Wheel. Dozen Bet – betting on one of the 12 sequences on the layout. Drop – term used to describe the total amount of money that has been cashed in at the table. Drop Box – Where the players money is placed when buying chips at the table. Edge – having an advantage over a game. Fair Game – A game where the casino nor the player have an edge. Please note Roulette is not a fair game, the casino has the edge. Fibonacci Betting System – a betting system where each bet is a combination of the previous numbers that have been hit by the wheel. Five Number Bet – The worst bet in Roulette on an American wheel. It is where a player bets 0,00,1,2, or 3 will hit. Flat Bettor – a player who bets the same size/unit each time. Floorman – Supervisor of all the tables operating. French Roulette Wheel – Same as the European Roulette wheel. Golden Numbers – numbers that are hitting at an incorrect probability. Could be labeled as biased-numbers. Grand Martingale – similar to the Martingale System where player doubles his bets or adds one unit after a loss. Grifter – a scammer or cheater. Grind Joint – A casino who targets low risk gamblers. Grind System – a system where players increase one unit after each win. Guerrilla Gambling – hitting and running. Making a score and leaving immediately. High Roller – a person that gambles big money. See more in the High Stakes Roulette page. Hot Table – a table where the players are winning more than the casino. House Edge – the mathematical edge a casino has over a player. Inside Bet – betting made on the numbered portion of the roulette layout. John – A good tipper. Layout – the design painted on the felt and where players place their bets. Line Bet – a wager that one of the six numbers of the two rows of three numbers will win. Low Bet – wagering on a number between 1 and 18 will hit. Mark – A player who will be cheated by a con-artist. Martingale Betting System – A system where the player doubles their bet after each loss. Match Play – a promotion that casinos run, where players are given play chips and if their bets win they receive back real chips. Money at Risk – the amount of money that is being wagered at once. Mucker – someone who is cheating and using sleight of hand techniques and most commonly past posting. Negative Progression – a system where a player increases the bets after a loss. Nickel – $5 dollar chips and are nearly always red. No Action – will be called once and a while during a spin. What happens here is that all bets are canceled and the casino repeats the action from the beginning. Bets may be removed after no action is called. Odd Bet – betting that the next number will be odd. This bet pays out 2-1. Odds – the statistical chance of an outcome. Outside Bets – wagering on the outside of the felt layout. Ex. Betting that the next spin will be odd. Paddle – a casino tool used to push money into the drop box. Parlay – doubling a bet after a win. Past Posting – Is where players make a wager after the winning number has been revealed. This is cheating. Pinching – removing chips after losing a bet. This is cheating. Pit – area of table games in a casino. Positive Progression – a system where a player increases bets after a win. Press – Increasing wager amounts after a win or a streak of wins. Quarter Bet – wagering that one of the four numbers will be a winner. Same as corner bet and square bet. Quarters – $25 chips and are most commonly green. Rating – labeling the player and their betting amounts for comps. Red Bet – an outside bet that pays 2-1 and is wagering that the next spin will land red. Scared Money – a player who is betting money that they can not afford to lose. Section Shooter – a dealer who attempts to hit a portion of the wheel each spin. Section Slicing – the act of dividing the wheel into sections based on which numbers are hot. This is a way of discovering bias numbers. Session – a period of time a table is open for or the length of time a player chooses to play for. Shill – Casino employee paid to pay to start games and encourage others to be more. Short End – side of a bet that pays off less than it will win. Single Zero Wheel – A wheel with only one zero, which is most commonly referred to as a European wheel. Stack – 20 roulette chips stacked on each other. Straight up Bet – betting on the inside on only one number. Street Bet – a bet where one of three numbers will hit on the next spin. Surrender – Some casinos will only take half of a players losing bets when the wheel hits 0 or 00. Toke – another term for tipping. Tom – opposite of a John, a bad tipper. Trio Bet – same bet as a street bet. Betting that one of three numbers will be the winning number. True Odds – the correct probability of a certain outcome. Vig or Vigorish – Is the juice taken by a casino. Visual Wheel Tracking – the process of following the ball and wheel and being able to predict where it will land. Wager – is the same thing as a bet. Wheel – is slang for Roulette Wheel. Wheel Chips – the chips used on roulette tables.